How Risky Is Netflix, Inc.? The digital video veteran may look wobbly in mid-2016, but next year will be different. Long story short: You should probably own Netflix today. Is Netflix really this scary? Image source: Getty Images. Netflix (NASDAQ:NFLX) is always a controversial stock. When share prices aren't flying sky-high, the stock is crashing hard instead. Over the last 52 weeks, Netflix shares have soared as high as $133.27 and dipped all the way down to $79.95. Is Netflix too risky to touch at today's prices? Let's have a look. The first group of worries gets the most press. Netflix is competing head to head with Amazon.com (NASDAQ:AMZN) in a few key markets, including the domestic one. A few other streaming video names pop up in various spots around the globe, including Alphabet's (NASDAQ:GOOG) (NASDAQ:GOOGL) paid video service YouTube Red and studio-backed alternative Hulu. All of these services are more or less comparable to what Netflix does, but always with a few key differences. We'll get back to that discussion in a minute. Competition is always growing, too. Content production king HBO, a division of Time Warner (NYSE:TWX.DL), is expanding its own streaming service to new markets. Now that Netflix works on a global level, the company is also running into local heroes in places like Britain and Indonesia. With such a plethora of rivals at the table, many investors see the crowded streaming video market undermining Netflix's future prospects. The market saturation problem builds on the competition issue, adding a limit to Netflix's market reach in any particular geography. So far, this worry is mainly confined to the domestic market, where critics expect the raging subscriber growth of recent years to fade quickly. Similar hockey-stick curves of the negative kind are expected to follow in international markets as they mature. Once competition and market saturation have drawn up solid limits for any particular market, Netflix must eventually raise prices if it wants to continue growing its revenues. Here, the worry is that current prices are about as high as Netflix customers are willing to go. In that case, any pricing increases would drive down the paying subscriber numbers with an iron fist. Some saw evidence of this in the recent second-quarter report, where subscriber growth disappointed because of pricing-related changes. Beyond these issues, the company must also grapple with data caps and weak payment systems in many countries. Low bandwidth caps -- often coupled with slow connection speeds -- will limit the real-world value of a Netflix subscription. Credit cards and online payment options are rare beasts in some countries, which makes it hard to sign up for Netflix services in the first place. These issues rarely come up in negative analyses of Netflix's investment value, but management points them out on occasion. Netflix tends to fight all three of the core risks in the same way: Find out what consumers want, then deliver exactly that thing to the best of your ability. It's a deceivingly simple formula. On the face of it, you'd expect that every company is following some version of the same creed. And yet, nobody else does it like Netflix. The "finding out" bit gets a great assist from Netflix's bulging data collection vaults. With nearly two decades of viewer habits to analyze, and a significant boost in detail and quality once the actual viewing moved online, the company can run deep analysis on those numbers to figure out what to do next. The most famous example of this is the original series House of Cards, which was commissioned based on intersecting fandoms of Kevin Spacey, political dramas, and characters breaking the Fourth Wall. Crucially, Netflix goes all-in when it finds a good-looking idea. Seasons of Netflix original shows are not doled out week by week, but dropped in fully formed entire-season batches. New shows don't need to prove their worth with a traditional pilot episode, and they sometimes get orders for a second or third season before the first one has even aired. You won't find commercial breaks in Netflix's streaming service, nor ad banners on the website. Nobody uses the "advanced search" tool? Heck, let's remove it -- too much choice leads to a land of confusion. Let me dig deeper into one of these policies. None of the rivaling services have sworn off advertising entirely. In particular, Amazon bends over backwards to get Amazon Prime Video viewers to pay up for non-free video streams, pay-per-view style. The complete lack of advertising may actually be the tastiest ingredient in the secret Netflix stew, but those ad pennies look like easy money to the old-school industry players. So, nobody follows Netflix's lead. Investors who stick closely to traditional tools such as price-to-earnings rations and discounted cash flow analysis are not Netflix fans today. 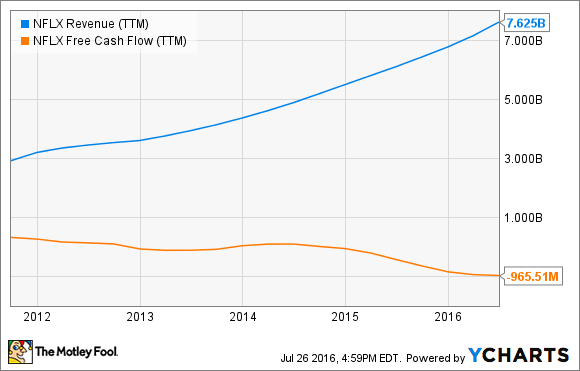 Management has chosen to keep earnings low and cash flows negative as it invests in extreme growth. We have been told that Netflix will probably take on more debt before the end of 2016, taking advantage of low interest rates to boost an ambitious content production slate. The stock trades for 285 times trailing earnings and 103 times forward estimates. And if you look at more forgiving metrics like price to sales, Netflix still looks more than twice as expensive as Time Warner. Any analysis based on backward-looking figures will reach similar conclusions. But things will change. Netflix CEO Reed Hastings has promised to take his foot off the accelerator next year, finally reserving a bit of the incoming revenues for investor-friendly earnings and maybe cash flows as well. Of course, we don't have any firm target sums for this promise yet. Analysts aren't helping much, either. The average Wall Street company sees Netflix delivering just 12% of earnings growth in 2017, culled from 23% higher sales. That's not in line with management's high-level forecast at all, and I would expect Netflix to grow earnings much faster than sales in 2017. Netflix sure looks like a risky stock today -- as long as you rely on reported numbers and ignore the growth that lies ahead. Revenue will continue to grow quickly for years to come as the huge international push starts to pay off. As earnings emerge from bulging sales and expanding margins, P/E ratios will come crashing down. By the middle of 2017, all of these trends should be crystal clear. In my view, Netflix has solid answers to all of its major risks. The biggest risk of all might be to stay on the sidelines as the stock grows into its breeches. Netflix is already the largest holding in my real-money retirement portfolio, and for good reason. The stock looks near-certain to rise in 2017 as the bigger picture becomes clear, and I would hate to miss that springboard moment.